Summertime always turns our minds to sitting outside. We love outdoor seating in our favorite restaurant, but we also love sitting outside on our own property. Patios are perfect for summer entertaining, or simply enjoying on a balmy evening with family. The ideal patio setup can turn your outdoors into a great entertaining space, leading to unforgettable summer nights. For these reasons, we’ve put together 5 patio construction designs that will transform your backyard. Though our summer days get quite warm, things tend to cool off in the evening. To make your patio more comfortable on summer nights, consider integrating a fire pit into your patio design. If your patio is walled, you might even trap some heat, getting the most out of your fire. 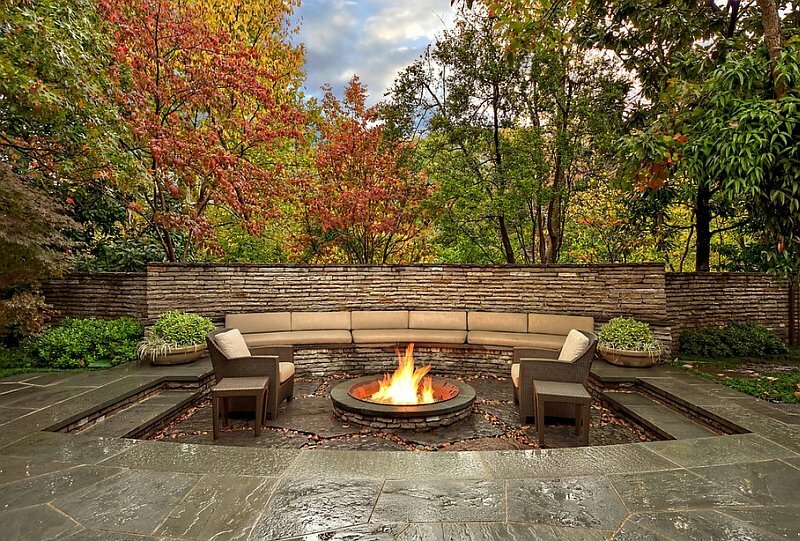 When you’re planning a patio layout, keep a fire pit in mind. They are very popular these days and for very good reasons. Your kids can roast marshmallows over the fire, join in a sing-along, or watch the flames crackle into the evening over a glass of wine with your closest friends. When the sun beats down on an exposed patio, you might prefer to lie on the grass under a tree. However, if you build a trellis over the patio and grow wisteria or some other running vine atop the structure, you will have shade all summer. If you want to entertain in the evening, leave enough space for a built-in, or portable, fire pit. Other patio cover ideas can include temporary tent-like structures and permanent roofing systems. For a more dramatic effect, raise your patio on a concrete platform. If you have a large, beautiful garden, you’ll love looking over the design from such a vantage point. Your guests will love coming over to enjoy the unique patio style. Build it large enough for a grill and a dining table and have extended family gatherings! If you love being outdoors all year round but aren’t too keen on winter’s chilly rain, build a roof over your patio. Then, have a stone fireplace installed. To trap the most heat, talk with your landscape contractor about a wall system. Sliding glass doors are one idea, as is a canvas-flap system. With the roof, you’ll be able to keep nicer furniture outside. An alternative to raised patios is naturally the sunken patio. When you step down into the patio, you can leave everything else behind. If your landscaping around the patio includes bushes or even thick ferns, you’ll enjoy a great deal of privacy for fun gatherings on warm evenings. For an interesting effect, you might build a seemingly short trellis structure and hideaway in a cooler shaded spot all summer long! Add a fire pit and you can extend the party well into football season. You’ll want to make sure to build a chimney for the fire pit. Our expert team at Crowley Landscape Management can work with your residential or commercial property layout to design the perfect patio. We will bring your vision to life with our patio construction services so that you can spend your time enjoying it. Get in touch with us to talk about patio construction designs today!